"Officers serving in the field are permitted to dispense with shoulder straps and the prescribed insignia of rank on their horse equipments. The marks of rank prescribed to be worn on the shoulder-straps will be worn on the shoulder in place of the strap. Officers are also permitted to wear overcoats of the same color and shape as those of the enlisted men of their command. No ornaments will be required on the overcoat, hats or forage caps; nor will sashes or epaulets be required. BY ORDER OF THE SECRETARY OF WAR"
Being an officer of U.S. Volunteers was a novelty early in the war and most officers wished to look the part. Images show officers in regulation uniforms down to the last detail. As the war proceeded several factors caused a shift in appearance. Certainly, part of this was a desire to appear like a veteran. More practically, soldiers in the field were interested in comfort. There was also the question of conspicuousness. Early in the war officers may have been viewed by some as "harmless gentlemen." As time progressed the understanding developed that the loss of officers decreased the effectiveness of an opposing unit. Officers became favored targets. In 1864 the above quoted General Orders allowed officers to wear a much more practical uniform in the field. It is likely that this order merely permitted what was already being done. There is very little about Captain Flint's appearance in the above photograph that would mark him as an officer. He is wearing a basic enlisted man's sack coat. He is wearing his grade devices (marks of rank) on on his shoulders rather than traditional shoulder straps. His forage cap lacks any kind of insignia. The Uniform Regulations of 1861 read that a sash was to be worn on all occasions of duty. Also both the 1851 and 1861 regulations read that "the epaulette may be dispensed with when not on duty..., and upon the march, except when, in war, there is immediate expectation of meeting the enemy,..." This implies that the 19th Century authors of the regulations could not conceive of meeting the enemy wearing anything other than epaulettes. The mention that epaulettes were no longer required further confirms that the regulations intended that officers wear epaulettes in combat. It would be interesting to known if any by-the-book officers truly wore epaulettes in battle. Finally, there is the question of insignia of rank on horse equipment. The regulations mention a "housing" for General Officers with a badge of rank embroidered in gold on it. There was a provision already in the regulations allowing officers in the field "to use horse equipment described for mounted service." 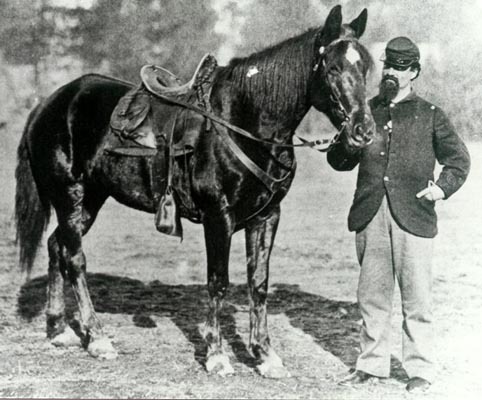 Captain Flint's horse equipment is a standard McClellan saddle. All in all there is little in Captain Flint's appearance to call attention to the fact he is an officer.